So this is long overdue. Just insert your own joke about neglected blogs and tumbleweeds and author platforms and such. I made the point at the con that I happily prioritised my writing over my blogging, and here I am, walking the talk. But Genrecon 2015 could not be allowed to slip past unremarked. Peter Ball, organizer extraordinaire, collected his thoughts on the massive project he has undertaken, to deserved acclaim, and had some interesting statements to make on the line-up. Kat Clay shared her detailed notes and images from the con. David Witteveen tweeted heaps and storified and shared and gathered together a wealth of knowledge and experience. He has continued to interview attendees. Have a little browse through his Twitter. Lisa L Hannett found joy. Angela Savage came as a guest and found herself a learner. From that sampling (and it is merely a small sampling) you can follow down the various rabbit holes of the multi-faceted experience of Genrecon, but it is these which most resonate with me. Genrecon was well-organised and well-run, it was such a full program that you couldn’t possibly see everything you wanted to see, it was a weekend of fun and joy, and it was a weekend that taught me so much. This was my third Genrecon. The first, in 2012, was in Western Sydney. 2013 and 2015 have been in Brisbane. I came to the first because I had reached a stage in my writing where I had become prepared for some select few others to know that it was something I was doing, and I was encouraged by the partner of an old friend to contact Peter Ball and seek advice. He was generous with his advice, and he mentioned Genrecon. I heard that there would be the opportunity to pitch to a NY agent, and then heard that Joe Abercrombie would be the guest of honour. I am a big fan of Abercrombie’s work, and so I was sold. I came to the second Genrecon invigorated by the first, pitching the same book but now much improved. Again the guest of honour was a writer I greatly admired, Chuck Wendig. I had actually tweeted at Peter to invite Chuck, so I will boast that I inspired the choice—the truth be damned. In both cases what impressed me about Genrecon was the sense of community. It was a family, made up of disparate and quite different parts, but coming together in a mutually supportive whole. Before my first Genrecon I had a clichéd and dismissive attitude toward Romance. That shames me now. It was naïve at best, and certainly ignorant. The Romance writers I have met at three Genrecons have been among the most forthcoming, encouraging, supportive and savvy writers. An author with dozens of published books to her name will happily sit with a doe-eyed ingénue like myself and talk about plot and character conflict, and painstaking research of history, and the importance of a good contract, and the frustrations of bad cover art (or the elation when it is good). Romance is the biggest genre, the best-selling genre, and a genre in which talented writers work damn hard on their craft and their business. I have enormous respect for their work. Likewise Crime, which I once had associated with airport newsagencies and the dusty bookshelves of late-middle-age. These assumptions were shredded by several crime fiction writers, and a coup-de-grace delivered by John Connolly in 2013, who held an engrossing hour-long conversation within the Genrecon program, and with whom I had an engrossing and increasingly drunken conversation well into the early hours of Sunday morning at the hotel bar. This year it was karaoke (where Alan Baxter channelled Lemmy and Patrick O’Duffy left a lasting impression) and laser-tag. It was talking to CS Pacat (whose website is a work of art in itself!) about her growing awareness of the power in the story she was telling, and of the value in the words she wrote. It was conversations with Mary Robinette Kowal about dialect, accent, phonology and puppetry. It was talking with Nathan Farrugia about martial arts, or Justin Woolley about zombies, Steve Vincent about the Hoover Dam control room, Emma Osbourne about growing up in a small town in central Victoria. 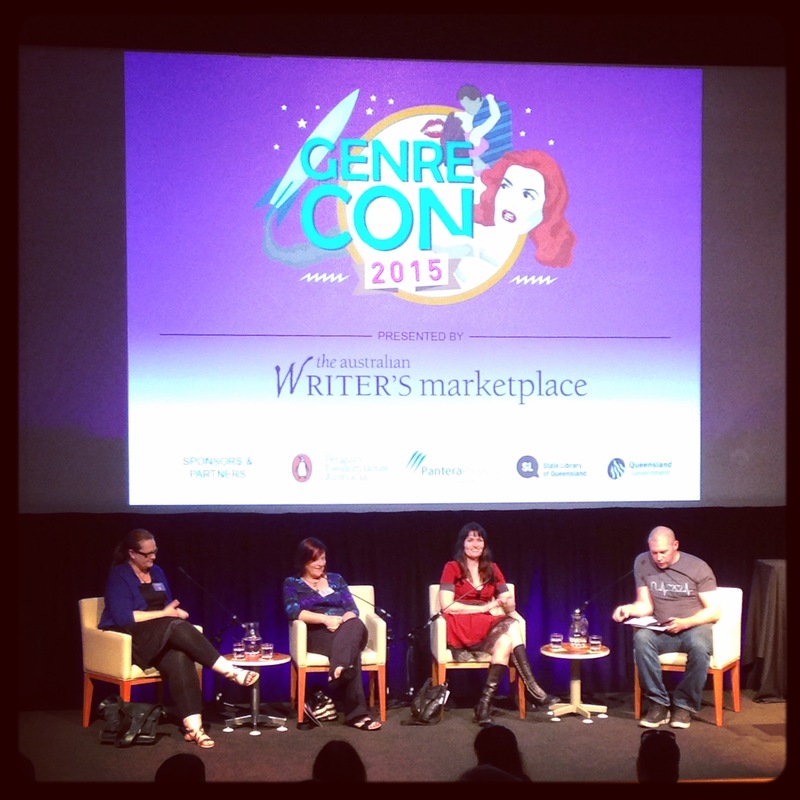 I volunteered to chair a panel this year, and I’m so glad I did. I was fortunate enough to be on stage with three extremely warm, wise and intelligent panelists. Kim Wilkins I knew from previous Genrecons (Genres-con? ), but I hadn’t met Keri Arthur until I sat down beside her at lunch one day and after some minutes chatting she mentioned that she would be on a panel, and I mentioned that I would be chairing one. ‘Which one?’ she asked, from which we discovered that it would be the same one. Angela Slatter (now ‘World Fantasy Award Winner’ to go along with the many other well-deserved honourifics in her bio) I didn’t meet until we were onstage together and the crowd was filing in. The nerves were short-lived though, and the panel soon became an open and easily moderated conversation, from which I learnt a great deal. I also pitched my new novel to Alex Adsett, whose reputation as an agent of genre-fiction in Australia is unsurpassed. It went well, despite my feeling that I rushed a little and fumbled over words. Alex was very enthusiastic and requested the full manuscript, which I happily submitted. I could not have hoped for a better outcome from the pitch, but now the waiting game to see what comes of it. A good pitch is a helpful thing, but it doesn’t matter unless there’s a good book behind it. The next Genrecon is 2017, and I can’t wait. I will definitely volunteer to be involved again, in whatever capacity I can be. It is a wonderful convention, where the unpublished can rub shoulders and raise a glass with NY Times Best Sellers, and where International guests are scribbling down notes and advice given by authors whose debut is not yet on shelves. If you are in any way connected to the Australian genre writing community, I cannot recommend it highly enough. A huge thank you, and a congratulations are due to Peter and all his many helpers, to the State Library QLD and the Australian Writer’s Marketplace, to all the guests and panelists, and to everyone who made it possible.